~Green Bay — The Arizona Cardinals’ 38-8 trouncing of the visiting Green Bay Packers on Sunday must have been quite an eye-opener for general manager Ted Thompson and coach Mike McCarthy. Starting the day, just two games separated the two teams in the standings. At the end of the day, the Cardinals’ superiority in how GM Steve Keim has built a team and coach Bruce Arians has prepared a team was rather obvious. Now we’ll find out if Thompson and McCarthy have something more to draw upon as the Packers attempt to win the NFC North Division and advance through the playoffs. Playing press-man coverage in front of two backup safeties, the Cardinals basically stifled the receivers other than James Jones (played 66 of a possible 72 snaps). Operating against Justin Bethel, a special-teams ace pressed into starting duty outside with the season-ending injury to Tyrann Mathieu, Jones had team-high totals of five receptions and 46 yards plus a two-point conversion. He schooled Bethel three times on back-shoulder throws for 28 yards and drew a 49-yard penalty for pass interference against him. Jones also beat him deep on a stop-and-go route for what should have been a 37-yard TD but the ball was overthrown. On the down side, Jones failed to free himself deep when McCarthy called the old deep bootleg pass that used to go to Jordy Nelson and Greg Jennings, and he should have done more to break up the interception by Bethel in the end-zone corner. Patrick Peterson shadowed Randall Cobb (62 at WR, seven at RB) more than anyone else and took him out of the game. Targeted just three times, Cobb caught them for 15 yards. He was 1-2 against Peterson. Cobb also let Peterson play right through his block before he tackled Jones on a bubble screen. Other than a 38-yard reception against blown coverage, Davante Adams (51) was shackled by veteran Jerraud Powers. After the catch, Adams demonstrated no poise (or intelligence) whatsoever spiking the ball for a penalty. He also dropped a short TD pass and was unable to fight his way into the end zone on a slant from the 2. For the fourth straight game Jared Abbrederis (14) got the call ahead of Jeff Janis (two). Abbrederis ran a nice over route with a subtle secondary move well downfield but then dropped the 23-yard pass. Andrew Quarless (25) returned for the first time since Game 3 and showed good hands catching a third-and-6 pass for 13 that was behind him. Neither Quarless nor Richard Rodgers (48) was an effective run blocker. Of Don Barclay‘s 351 snaps this season before Sunday, just 39 came at LT. He did a respectable job as 21-game starter in 2012-’13, but that was at RT and before August 2014 reconstructive knee surgery. Starting for injured LT David Bakhtiari (ankle), Barclay was overmatched. Of his 4½ sacks allowed, three were to old pro Dwight Freeney and 1½ on end-tackle twists to dominating DE Calais Campbell. He also allowed four hurries for a total of 8½ pressures. Barclay was much better in the run game, but he did have a critical miss on an off-tackle toss that started out looking like it would be a TD. When Barclay overran ILB Kevin Minter, Eddie Lacy was tackled for a gain of only 3. Bryan Bulaga was humming along against the edge rushers on the other side when he departed after 36 snaps with an ankle injury. Josh Walker got the call, but after he allowed four pressures in a disastrous 20 snaps, the coaches inserted JC Tretter for the final 16. Tretter was much more effective than Walker, who is better at guard than tackle. The unit drew five penalties (two were accepted), and early holds against Corey Linsley (71) and Josh Sitton (66) were costly. Sitton and T.J. Lang (65) both played better than Linsley before making their exits during garbage time. Another reason why the run by Lacy didn’t go the 13-yard distance before the half was the fact that undersized ILB Deone Bucannon made a great play, getting leverage on the pulling Linsley and compressing the hole. Coordinator Jeff Bettcher blitzed on 38.1% of passes, one of his lowest totals of the season, because five of the nine sacks came on either three- or four-man rushes. Against a team as formidable as Arizona, the Packers’ best chance was to get magnificent play from their quarterback. When Aaron Rodgers turned the ball over three times, completed 53.6% and didn’t cut an inspiring figure around whom the team could rally, the offense and the team were doomed. On the second series, he threw high for an open Adams on third and 5. On the fourth series, he threw slightly behind Rodgers on third and 2. In the third quarter, he missed Jones on what for him should be an almost routine 37-yard TD. But Rodgers hasn’t been accurate on the deep ball all year. On two of his eight sacks, he pump-faked for 3.7 and 4.2 seconds when it was incumbent upon him to get the ball out of his hand. This also was the first time in Rodgers’ career that he fumbled three times. Two were from the blind side, but ball security is priority No. 1 for McCarthy’s quarterbacks. His interception was placed high and in the middle when it probably had to be thrown low and away. On the blown coverage, Adams had a chance to go all or a lot of the 98 yards but the pass made him turn back and around, destroying his momentum. Sometimes Rodgers is throwing as he leaves his feet, and at times it leaves him in poor position to get the ball out of his hand. Why did Rodgers spin the ball and jaw at the Cardinals’ bench when Powers upended him near the sideline after a scramble? He didn’t run out of bounds. The Packers need a leader, and that isn’t leadership. Rodgers has been remarkably durable. He takes a beating and always comes back for more. That has been the best part of his game this season. Scott Tolzien’s six snaps included a fumbled exchange. Eddie Lacy (45) made his third straight start and did some damage. He didn’t break any tackles but he dragged the pile on a consistent basis. When Minter hit him solidly on a second-half carry, Lacy carried him and others five more yards. Presumably injured in the Oakland game, Lacy practiced sparingly all week because of a rib injury. After several of his 13 touches, Lacy was holding his ribs as if in pain. He continues to show patience and burst on screens, following Lang on one for a 28-yard TD. Of the team’s last 13 TD passes, four have come on screens. His pass blocking was spotty; the 187-pound Powers actually shoved him out of the way and got in on a sack. This was the second game in a month in which Lacy made a poor effort on a return by the defense. There is no excuse for not getting DE Cory Redding down at the 25 on the fumble return that went 36 for a TD. James Starks’ day ended on the sixth play when he probably tried to do too much and fumbled on a hit by FS D.J. Swearinger. Although Starks was running left, the ball was in his right hand. Swearinger said he noticed that on tape and judged the angle of his strike accordingly. B.J. Raji got off to a fast start, blowing up C Lyle Sendlein on a tackle for loss. When he suffered a concussion on his sixth snap, Mike Pennel (30 of a possible 58 snaps) and Letroy Guion (23) traded off next to Mike Daniels (37) in nickel and with him in just the eight snaps of 3-4. Pennel registered a most impressive sack, rag-dolling RG Ted Larsen. Later, he came off a block by backup LG Jonathan Cooper with one arm and forced a fumble by Kerwynn Williams. It was the third fumble on a running play that the Packers have recovered this season. Guion continued his late-season rise, shedding Sendlein and his backup, A.Q. Shipley, three times for tackles on rushes. Too often, however, Carson Palmer was able to step up because the inside rush failed to collapse his throwing cup. This might have been the first game all season that Daniels didn’t have a pressure. Daniels did make an exceptional interception, reading screen and making the catch at point-blank range. If the high-school running back had cut back, it would have been a TD. Datone Jones played more at OLB (27) than at DE (seven). His pass rush has hit a lull. The Packers need him to get going again. With a stationary target like Palmer, pass rushers are allowed to work inside at times in addition to bull and edge rush. On Palmer’s 32 dropbacks, the unit tallied just two pressures. Mike Neal (20 at OLB, 12 at DL) made a spectacular sack on an early third and 4, beating LG Mike Iupati on his outside edge. The only other pressure came from Clay Matthews (30 at ILB, 18 at OLB) on a bull rush and chase. Julius Peppers (17 at OLB, nine at DL) never could solve RT Bobby Massie despite just 20% double-teaming on passes. With Jayrone Elliott (thigh) out, Nick Perry (34) got more exposure and set a strong edge against the run. Once again, Perry offered next to nothing as a rusher. The rush flashes that were there a year ago haven’t been seen in 2015. Perry’s limitations in space were evident on his missed tackle of David Johnson’s 44-yard swing pass. Jake Ryan (41) also failed on that play, one of his three missed tackles. Palmer succeeded in matching Johnson on Ryan three times for big gains. If Ryan has any chance of holding up against a talent like Johnson, he must be perfect with his leverage and technique. When he wasn’t, it was Katy bar the door. At the end, Nate Palmer (one) and Ryan (two) lined up at OLB. When they screamed up the field, the Cardinals ran the ball underneath them off right tackle for gains of 18 and 19 yards. For the second straight game, Matthews didn’t have a single tackle. On Johnson’s second carry, Matthews met him squarely at the line, crumpled and the gain was 6. As a rusher against LT Jared Veldheer and as a run stuffer, Matthews was next to invisible. Dime LB Joe Thomas (27) ran back so far in the deep middle on the 47-yard dig to Michael Floyd, it looked like he was defending a Hail Mary. If Thomas was too deep, Micah Hyde (21) wasn’t quite deep enough on the dig to Floyd that began Arizona’s backbreaking 80-yard TD drive in 51 seconds to end the half. Palmer’s pass cleared Hyde on his curl drop and then Floyd ran away from the pack. It seemed as if the matchups coach Bruce Arians desired were Johnson against Ryan and Floyd against Casey Hayward (56). On the first play, Floyd used his big advantages in size and speed to run by Hayward on a slot fade but short-armed the catch when Ha Ha Clinton-Dix (58) closed fast to the boundary and delivered a solid body shot. On the left side, Damarious Randall (57) once again wasn’t on top of his game. Too often, he’s still moving and not set up properly when the ball’s about to be snapped. He didn’t play very physically, which leads to larger receivers gaining leverage on him. On the right side, Quinten Rollins (49) was the team’s best cornerback. He isn’t as speedy as Randall but there’s a competitive edge to him. His overall game is progressing nicely. Clinton-Dix didn’t show much speed on Johnson’s 14-yard TD burst, but both he and Morgan Burnett (58) were solid. Burnett made a terrific play on the goal-line breaking with explosiveness as Johnson dropped the pass in the flat. Tim Masthay made the gutsy fake-punt call work, sticking his foot in the ground and taking the ball down the alley for 7 on fourth and 2. He also punted well, averaging 44.7 yards (gross), 43.2 (net) and 4.22 seconds (hang time) on six attempts. Mason Crosby’s only kickoff was stellar but his onside kick wasn’t. It went just eight yards. For the first time all season this area had three penalties. In fact, the special teams had been hit with merely five fouls in the previous six games. Janis’ facemask penalty set up the short field leading to the Cardinals’ opening TD. He met his match on the perimeter in Bethel, a three-time Pro Bowl choice. Chris Banjo sustained his block in space forever on Williams to give Masthay daylight. The snapping debut of rookie Rick Lovato was uneventful, just the way he wanted it. Demetri Goodson seemed to get away with punt-coverage interference on the catch that Peterson fumbled. The Packers’ return game was kept at bay. ~In the Packers first visit to Oakland since the famous Monday Night in 2003 when Brett Favre was playing just a day after his father Irv died, the Packers got another important win, albeit a lot uglier, in a 30-20 win. Aaron Rodgers and Eddie Lacy each had bad games, but the defense picked off Derek Carr two times and sacked him three times, holding the Raiders down. With the win, the Packers moved to 10-4 and officially clinched a playoff spot, again, for the 7th consecutive season. They remain a game up on the Minnesota Vikings, who at 9-5, whipped the Bears today. James Starks had 51 yards on 9 carries, although he had a costly fumble. Lacy got the ball more, 11 times, for a whopping total of 23 yards, or an average of 2.1. John Crockett, once again, did not dress. Rodgers threw an inexplicable interception late in the 4th quarter when the Packers were just trying to seal the game and the clock was their friend. He’ll find a way to blame Jeff Janis whom he appeared to be throwing to. Janis had the outside, but Rodgers pass was too far inside. The play call should have been a run anyway there as time was on the Packers side. James Jones had six catches, including a touchdown against the team he played for last year and was cut from this off-season. John Kuhn also scored for the Packers on offense. Rookie Damarious Randall had a pick-six, although he was often beaten by fellow rookie Amari Cooper, who finished with 120 yards and scored two touchdowns. Julius Peppers led the way on defense with 2 1/2 sacks and 3 QB hits. Micah Hyde also had an interception which was almost a pick-six. Once again, the Packers short-yardage offense was absolutely atrocious. First and goal from the Raiders one-yard line. Bad pass, bad run, another bad pass, and the Packers had to settle for three points. One would think that from the one-yard line, three runs, including QB-sneaks as an option, would be able to get a yard for the touchdown. Not the Packers. Not even with two big backs in Starks and Lacy, and what was supposedly a good offensive line. These failures have been a recurring theme in Green Bay regardless of who the linemen and running backs are. It kept them from the Super Bowl last year as there were two short yardage failures early in the NFC Championship games which resulted in field goals instead of touchdowns. Rodgers also in that game missed a simple short touchdown pass to Jordy Nelson on a short out to the left. If the Packers cannot find away to score touchdowns instead of short field goals, they again will exit the playoffs short of the Super Bowl. Julius Peppers -He made big plays in the backfield and hurried Carr much of the game. Jared Abbrederis -Only thrown to three times, it resulted in three completions for 33 yards, including a key first down catch against a big hit. Eddie Lacy – He ran soft. His carry on 2nd & goal in the 4th quarter was disturbing as he got the ball, didn’t like what he saw and he studder-stepped, and turned it into a four-yard loss. He also, earlier in the game, had a gain of eight yards and a well-designed play. But he kept going too far outside and was ultimately pushed out two yards short of the first down, resulting in a 3rd & two, which the Packers are terrible converting, and predictably didn’t pick up. He could have easily cut it more to the right, upfield, before the sideline got him. Aaron Rodgers – His overall passer rating was 68.8. He averaged a puny 5.2 yards per attempt, and his interception in the end zone was awful. It’s not the decision we expect from him, and his accuracy was bad on it. He also missed Jeff Janis in the red zone earlier on a third down short throw that was a foot or two, or three too high. Janis had time to get his hands way up, but in the wet conditions, that was a very difficult catch on what should have been a simple pitch and catch. With the win today at Oakland, the Packers have bettered last year’s road record. Last year, the Packers were 4-4 on the road, and then 0-1 on the road in the playoffs. Today’s win gives the Packers a 5-2 road record, with next week’s game at Arizona to come, so a 5-3 road record is likely. Had the Packers gone 5-3 on the road last year, they would have earned the #1 seed and had home-field advantage. ~Green Bay— The news broke around lunch time Sunday, minutes before the wave of noon games kicked off across the National Football League: Mike McCarthy, coach of the Green Bay Packers, had taken back play-calling duties on offense. The change, which was first reported by FOX, reversed course on a move McCarthy made in February, shortly after his team lost to the Seattle Seahawks in the NFC Championship game. The role he bestowed upon Tom Clements, his associate head coach/offense, reached its expiration date after just 12 games, a number of ugly performances and surprisingly uncharacteristic statistics from quarterback Aaron Rodgers. With no Tony Romo at quarterback, the Packers defense was able to mostly smother the Cowboys offense with Matt Cassell. That McCarthy was back in charge of the offense ushered in a wave of optimism from fans, and plenty of them expressed their adulation on social media. This was the move, they hoped, that would rediscover the explosiveness so often seen with Rodgers leading the way. This was the decision, they felt, that was weeks overdue after ugly showings against a handful of opponents, including a number of division games. Anticipation translated to a refreshing first half against the Dallas Cowboys. Rodgers played efficiently (17-of-24 for 171 yards and two touchdowns), and the running game piled up yards behind tailback Eddie Lacy, reinstated after his demotion last week. Richie Rodgers catches a touchdown pass from Aaron Rodgers. Photo snapped by Rick Wood. The result was a balanced offense — and a 14-7 advantage — unseen since before the bye in October. At one point, the Packers had run 40 total plays with a dead-even split — 20 runs, 20 passes. With the score still the same midway through the fourth quarter, the Packers turned again to the run. McCarthy dialed up rushing play after rushing play for Eddie Lacy and James Starks, gaining yards in chunks and draining the clock. Starks preserved the win with a 30-yard burst up the middle to give the Packers a 21-7 lead with 4:44 remaining. A 1-yard touchdown by Lacy less than two minutes later secured a 28-7 victory. Player of the Game: Lacy. Demoted last week against the Detroit Lions for missing curfew the night before the game, Lacy responded with an impressive effort that overflowed with energy. He ripped off yards in piles by breaking tackles and spinning through the line of scrimmage, and a handful of plays were punctuated with emotional screams. He finished with 124 yards on 24 carries. 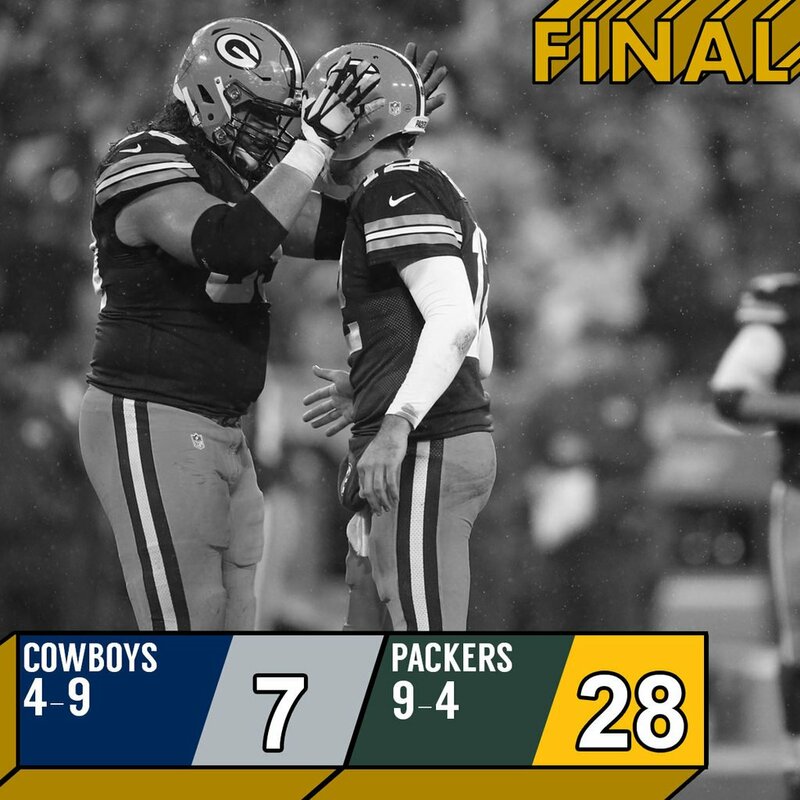 Turning point: Leading 14-7 in a game that was not as close as the score indicated, the Packers needed to put away the Cowboys, a team playing without starting quarterback Tony Romo. They mounted a punishing 12-play, 84-yard drive that ate up more than 6 minutes of game time and featured seven runs of 5 yards or more. James Starks broke loose up the middle for a 30-yard touchdown that broke the game open, pushing the Packers ahead by two scores. The offensively challenged Cowboys could not recover. Big number: 42 — Rushing attempts for the Packers that showcased a balanced offensive attack featuring 124 ards from Eddie Lacy and 71 yards from James Starks. What went right: Put simply, this was exactly the type of offensive performance the Packers needed. Responding to a change in play caller made public hours before kickoff, the Packers played with passion, ruthlessness and efficiency — all traits that had been missing this season. Rodgers threw for more than 150 yards and two touchdowns in the first half and the running attack won the day by racking up first downs (and scores) in the second. A bunch that ranked 22nd in the league in total offense and 15th in rushing yards per game made a legitimate statement at Lambeau Field. What went wrong: The short-yardage woes continue for the Packers in a trend that appears to be independent of the play caller. Quarterback Aaron Rodgers was stuffed on fourth-and-goal from inside the 1-yard line on a play that followed three previous failures from a maximum of 12 feet outside the end zone. In the third quarter, this time on third and 1, Rodgers threw a strange lofted pass to fullback John Kuhn that fell incomplete and never had a chance. On the defensive side of the ball, the Cowboys found a good deal of success running the football. Their first touchdown drive featured four running plays that gobbled up 80 yards in an instant, highlighted by a 45-yard gain by Darren McFadden. For the game, the Cowboys finished with 171 yards rushing. ~The playoff picture changes from week to week, from game to game. Heck, it changes from play to play, as the Packers learned in a good way last Thursday night with the Hail Mary Miracle in Motown. That being said, aside from the undefeated Panthers, and the 2-loss Cardinals, the most dangerous team is without a doubt the two-time defending NFC Champion Seattle Seahawks. They killed the Vikings last week, and aside from losing their tight end Jimmy Graham, they’re healthy everywhere on defense. All their stars on defense magically stay healthy. The Football Outsiders playoff odds simulation is all about probability. And nothing shakes up those odds like an improbable upset. Last week, our simulation only gave the Philadelphia Eagles a 24 percent chance of beating the New England Patriots in Foxborough, Massachusetts. ESPN Stats & Information FPI had the odds even lower, at 22 percent. The Eagles’ win is even more improbable when you consider how they won the game. The Patriots’ special teams, which were the best in the league, had the worst game of any special teams unit this season. The odds of giving up a punt return touchdown and a punt block touchdown in the same game are miniscule. There have been 12 punt-return touchdowns in 192 games this season and four punt-block touchdowns. Based on those numbers, the odds of having both in the same game are roughly 1 in 768. Obviously that doesn’t consider the quality of the players involved, but there was quality on both sides here. Darren Sproles is an excellent punt returner, while the Patriots ranked sixth in Football Outsiders’ net punting metric through Week 12. Adding to the improbability was Malcolm Jenkins‘ 99-yard pick-six. There have been 25 interceptions this season thrown within 10 yards of the end zone, and only three of those have been returned past the 20: a 29-yard return when Stephon Gilmore picked off Eli Manning in Week 4, a 42-yard return when Antwon Blake picked off Andy Dalton in Week 8, and Jenkins’ touchdown. The Eagles’ win shook up the race for home-field advantage in the AFC, as well as the fight for the NFC East title. The Patriots’ odds of getting the No. 1 seed were cut almost in half, falling from 50.1 percent to 26.1 percent. Our new simulation has them representing the AFC in Super Bowl 50 just 22.2 percent of the time, less than Cincinnati or Denver. Meanwhile, the Eagles’ win, combined with losses for the Giants and Redskins, made Philadelphia once again the favorite to win the NFC East. All three teams are tied at 5-7, but the Eagles win the division in 42.7 percent of our simulations — in part because they have three games left at home, while the Giants have just two and the Redskins only one. About these odds: The Football Outsiders playoff odds simulation plays out the rest of the season 25,000 times. A random draw assigns each team a win or loss for each game. (Like Donovan McNabb, the playoff odds simulation does not believe in ties.) The probabilities are based on each team’s current weighted DVOA rating as well as home-field advantage. (DVOA is Football Outsiders’ proprietary Defense-adjusted Value Over Average metric which looks at a team’s performance on every play and adjusts based on situation and opponent, explained further here. Weighted DVOA then takes that rating and adjusts it to lower the strength of games that took place more than a month ago.) Some ratings are adjusted prior the simulation because of injuries, primarily to quarterbacks. Note that our odds will be different than playoff odds you might find elsewhere on ESPN.com (or at FiveThirtyEight.com) because of each set of team ratings is computed differently. You can find the full playoff odds report, including the odds of each team winning each of the six seeds, on FootballOutsiders.com. Although the Panthers escaped from New Orleans after a fourth-quarter comeback on the road, our DVOA ratings suggest that this week’s game was a negative indicator for Carolina’s chances of winning Super Bowl 50. The Panthers had a single-game DVOA of minus-27.3 percent, by far their worst single game of the season and their first game below average since Week 3. Because of that, Carolina dropped from third to fourth in weighted DVOA, and from fourth to sixth in total DVOA (which gives full strength to early games). That ratings drop is an even bigger problem since most of the other contenders had big wins this week, particularly Carolina’s NFC rivals in Seattle and Arizona. Therefore, while we still have Carolina as our Super Bowl favorite, the Panthers’ odds of winning it all actually dropped from 23.9 percent to 19.9 percent. Since the Panthers were already heavy favorites to beat New Orleans, their odds of finishing a 16-0 regular season only went up slightly, and now stand at 25.9 percent. That being said, it may be that the Saints offense is just a bad matchup for the Panthers defense. According to both defensive DVOA and yards per play allowed, Carolina’s worst two games of the season have come against New Orleans in Weeks 3 and 13. Arizona’s odds of getting a first-round bye went up even further this week and are now at 84.8 percent. I wrote last week about how Arizona had declined in recent weeks, but the win over St. Louis was their third-best game of the year according to DVOA. The Packers and Vikings are still both likely to make the playoffs, but the Rodgers-to-Rodgers Hail Mary made a huge difference in the race to win the division and get a first-round home game. We now have the Packers winning the division in 61.6 percent of simulations, with the Vikings at 38.4 percent. Both teams are likely to lose in Arizona — Minnesota this week, Green Bay in Week 16 — and the division still probably comes down to the Vikings’ visit to Lambeau Field in Week 17. The Sam Bradford-for-Nick Foles trade seems like a huge disappointment for both teams, but there’s no question that Bradford has been significantly better than backup Mark Sanchez this season. According to DVOA, Philadelphia’s offense was 5.5 percent worse than average in Weeks 1-9. With Sanchez at quarterback, the Eagles offense was 30.1 percent worse than average for the next three games. This week, Bradford was back, and the Eagles offense was back to being mediocre instead of terrible, with minus-5.8 percent offensive DVOA. The return of Bradford is the biggest reason why the Eagles are now the division favorites; with him at quarterback, they’re the best team in the NFC East. The Eagles play the toughest remaining schedule based on average DVOA of opponent, but that’s balanced out by the fact that they have three of four games at home. We currently have the Eagles winning the division 42.7 percent of the time, with Washington at 31.0 percent, the Giants at 20.8 percent, and Dallas at 5.5 percent. Although every team in the NFC East currently has a losing record, our simulations think we’re still likely to get a division champion that’s at least 8-8. The NFC East champion goes 9-7 in 16.5 percent of simulations and 8-8 in 52.2 percent of simulations. We also get a 7-9 champion 31.3 percent of the time and a 6-10 champion 1.3 percent of the time. Say it loud, they’re back and proud! Actually, the Seahawks never really went anywhere; despite all the close losses, they’ve been in the DVOA top 10 since Week 5. But with the huge win over Minnesota and some of their early defensive struggles now further in the rearview mirror, Seattle moved past Kansas City into the No. 1 spot in weighted DVOA this week. Yes, they’ll have to play every playoff game on the road, but this is still a dangerous team that both Carolina and Arizona need to be worried about for January. Minnesota’s horrible loss to Seattle was their worst game since the Week 1 loss to San Francisco, and this time the Vikings can’t use the road or the unusually late hour as an excuse. (They could cite injuries on defense, however.) And yet, it meant very little change to Minnesota’s overall playoff odds, because the Vikings (or, if Minnesota wins the division, the Packers) still have a two-game lead over any other contender for the second NFC wild card. The biggest change based on Seattle’s huge win is that it increased the chances that we’ll get Green Bay and Minnesota playing back-to-back in consecutive weeks, with the winner of the Week 17 game getting the No. 3 seed and the loser getting No. 6. It’s quite likely that the Vikings and Packers will play each other in week 17 & the next week Wildcard Weekend. The Packers can avoid that scenario by winning their next 4 games, and having Arizona lose one of their other 3 games. They play Minnesota, at Philadelphia, and host Seattle. If Arizona lost at least one of them, plus the Packers go 4-0, then the Packers would earn the #2 seed behind Carolina. (On health of the team) So far, so good. They looked good. Weight room work was good. … We had a chance to review the Lions tape, and now we’re moving on to the Dallas install. (On watching tape from Lions game) I think we did some things better. There’s still some things we can obviously improve on. There were a few plays in the first half that were really the difference between 17-0. … It’s important to always watch the tape of yourselves. That’s why we took the first part of today to focus on the Lions game. (On the offensive line’s health) Offensive lines that play together each week, I think you just want to do an injury report (and have them on there). If you look at starts, that equates to really good football. It’s important. We all understand it starts up front. … As many games as those guys can play together, it helps your success. (On Eddie Lacy missing curfew) I think Eddie has been rejuvenated. His work was good today. I look for him to have a very good week of practice and look for him to be productive Sunday. … We’re really focused on today and beating the Cowboys. That’s what I want everybody to think about, talk about and that’s what we’re looking forward to. (On offensive line talent) It’s the best offensive line that I’ve had in my time here. We’re going into our 13th game. We understand the stretch we’ve been through. It’s in the past. We’ve also shown that eight or nine guys can play. (On Ty Montgomery) The report this morning was that Ty is feeling better. He’s going to try and work today. We’ll see. He’s going to do as much as he can. (On Dallas Cowboys) They blitzed more than they have. The tendency was up last night. It’s a very good defense. Spending the weekend going through the numbers and the video, it’s going to be a very big challenge for our offense. (On regaining success at home) We need to win. We do that by playing better. We haven’t played our best football the last two times we’ve played in front of our crowd. … At the end of the day it’s about football. It’s about what you do between the lines. (On Eddie Lacy’s status going forward) Everything Eddie wants to accomplish is right there in front of him. That’s what we’re focusing on today. (On John Crockett) It’s right in front of him. He got a good opportunity up in Detroit. … He brings a lot of excitement. I’m really happy for John and the opportunity he’s been given. (On Aaron Rodgers’ health) He looks good. My understanding is he worked out a couple of times over the weekend. I feel good about where he is. ~A few days removed from their stunning, possibly season-changing Hail Mary win at Detroit, Mike McCarthy has to decide where the Green Bay Packers go from here. Three-quarters of the way through the season, McCarthy’s team is 8-4 and tied for the lead in the NFC North. If the playoffs started today, the Packers would be seeded third in the NFC. But there’s a bigger issue. They’re stuck in a sustained stretch of pedestrian offensive play that dates to their 17-3 win at San Francisco in Week 4. Rodgers reaction after seeing the “film-video” of his final play failure with the game on the line, against Carolina. If McCarthy doesn’t get his offense and quarterback Aaron Rodgers playing at their previously elite levels, then it doesn’t matter where the Packers finish in the standings. They’re not going anywhere in the playoffs anyway. This weekend I had a long talk with Eric Baranczyk, with whom I collaborate on a weekly video breakdown of Packers games, and we concluded that McCarthy essentially has three choices: He can look for the necessary changes in scheme, play calling and personnel within the offense’s current coaching structure; bring in an outside consultant, in this case his former offensive coordinator, recently fired Miami Dolphins coach Joe Philbin; or he can scrap his offseason changes in coaching responsibilities and go back to the setup that served the team well last year. The guess here is that he’ll try to make it work within the current framework. As is, McCarthy has a role in offensive game planning, but Tom Clements calls plays, Edgar Bennett is offensive coordinator and Alex Van Pelt coaches quarterbacks and receivers. The problem is, that setup has produced a mostly underachieving offense for more than two months. Whether it’s the play calling itself or something lost in the new distribution of responsibilities, it’s just not working. The Packers would have had about 8-10 touchdowns from Nelson had he been healthy this year . The book on Rodgers used to be rush four, play two safeties deep and flood the field with coverage. Now, as started by 49ers defensive coordinator Eric Mangini in early October, it’s bring up a safety, keep Rodgers in the pocket and use the occasional blitz without undue fear. Even the play-calling operation appears slower than before. McCarthy wants a fast tempo, but it seems like Rodgers is getting the calls from the sidelines late and snapping it at the end of the play clock, and not always just to get the defense to show its hand. It’s simply hard not conclude after three-quarters of the season that McCarthy’s decision to give up play calling and rearrange staff duties was a mistake. The idea of bringing in Philbin is hardly novel – a fan or two has emailed us with just that suggestion. And we have to say up front, when teams hire consultants during the season, it’s a sign of disaster. In October 2009, for instance, Washington brought in former Packers assistant Sherman Lewis as an offensive consultant in Jim Zorn’s final year as coach. That team finished 4-12. Likewise, after the Dolphins fired Philbin in October this year, interim coach Dan Campbell added long-time NFL assistant Al Saunders as an offensive consultant. The Dolphins are 5-7. But if not desperate, the Packers are the next-best thing. And bringing back Philbin actually makes some sense. Philbin worked for McCarthy from 2006-11. He knows the scheme, appears to have an excellent relationship with Rodgers and worked with many of the offensive players on the team. This wouldn’t be just some guy coming in from the outside. He has seen this quarterback and offense function at the highest level, and he might spot something that the Packers’ staff has missed while immersed in the thick of it. The problem is, the Packers probably have too many cooks on offense as it is. Before the offseason changes, McCarthy spearheaded game planning and called plays, Clements ran offensive meetings and Bennett was highly successful coaching the receivers. In the new setup, McCarthy still has a hand in game planning, but Clements puts together the call sheet and calls plays, and Bennett runs offensive meetings presenting the game plan to the players. Adding Philbin to the mix could just as easily confuse as clarify. There’s also no sign that McCarthy has seriously considered this route anyway. The third option is returning to last season’s setup, then re-evaluating in the offseason. That carries its own problems, namely disruption within the coaching staff. Few react well to losing responsibilities, and McCarthy’s taking over the offense would be a big blow to Clements. Then there’s the ripple effect. Either Bennett and Van Pelt would go back to their duties of 2014, with Bennett coaching receivers and Van Pelt only the quarterbacks, or remain in their current roles, with Clements in effect an extra top-level assistant. Either way, the staff’s chemistry would suffer. But this league is about only one thing: winning. So McCarthy has to do what he has to do. And the Packers led the NFL in scoring last season, so the one thing he knows is that system worked. It also wouldn’t be new for the players. McCarthy has had the weekend to return to earth after the Packers’ incredible Hail Mary win at Detroit. The sober truth is the same today as it was going into that game: The Packers’ offense (No. 24 in yards, No. 11 in points) is underperforming and nowhere near good enough to win the Super Bowl the way it has played for two long months. Now, maybe McCarthy and Clements can find the answers in their current roles. Maybe they’ve finally figured out how to get tight end Richard Rodgers open over the middle, rather than on fruitless short throws to the flats, during his eight-catch game last week. Maybe second-year receivers Jared Abbrederis and Jeff Janis will add more with increased playing time the final month. And maybe McCarthy and Clements will find a way to get Randall Cobb open more often on the intermediate routes over the middle that had been his calling card. The question is, what does McCarthy think? He very well might have decided he and Clements only need to persevere. Or perhaps he’s seen enough and will take the offense back to last year. Either way, it’s getting close to now or never. ~The Green Bay Packers needed some dumb luck to pull off their last-play win over the Detroit Lions on Thursday night. They also needed the quick feet and incredible arm strength of quarterback Aaron Rodgers. First, the dumb luck. On what looked like the game’s final play, third down from the Packers’ 21 with six seconds left, the Packers ran the lateral desperation play about as poorly as it can be run. When receiver James Jones caught the pass and lateraled to Richard Rodgers at about the Packers’ 40, Rodgers was in no-man’s land. You could see he really didn’t want the ball at that point, and it’s hard to blame him. All four of the other receivers were ahead of him, so he couldn’t pitch or throw the ball laterally to any of them. That included Davante Adams, who was across the field and standing rather than retreating, which would have given Rodgers another option for getting rid of the ball. The only teammates behind Rodgers were the five offensive linemen and Aaron Rodgers. And Richard Rodgers doesn’t have the speed or elusiveness to make tacklers miss, so though he wasn’t under imminent threat of being hit – the nearest defender was six yards away – he had nowhere to go. If he’d tried to run, there was a pretty good chance he’d have been tackled to end the game. So his least-worst option was to throw the ball back his safety valve, Aaron Rodgers. But that was of no help, because Aaron Rodgers caught the pass at his own 24, about 16 yards backward. He had two defenders with him and nowhere to turn as well. The dumb luck was that the Packers’ poor execution paid off because the facemask penalty on Lions defensive end Devin Taylor gave them 15 yards and a final, untimed play from their own 39. As for the penalty, there’s no blaming the officials for calling the facemask. Taylor’s thumb clearly hit Rodgers’ facemask, and Rodgers’ head turned hard. Both the referee and side judge threw their flag. A close look at the replay showed that Taylor’s thumb hit the facemask, but he probably didn’t grab it, as is required by the facemask rule. The play isn’t subject to review, but if it had been, it still might have been tough to overturn the call, because the replay wasn’t quite definitive. Some officials might have overturned it, others not. An interesting question, though, is whether Taylor should have been penalized 15 yards for a horse collar tackle. By all appearances, he grabbed Rodgers by the inside of his shoulder pad on the right side and threw him to the ground. The exceptions don’t appear to apply here. Rodgers was five yards past the line of scrimmage when Taylor tackled him. He no longer had the protection of a quarterback, because he couldn’t throw a forward pass, and it’s unclear whether the tackle box even existed anyway because of the pass completed downfield to Jones. Thank you zebra. Where was this call in the playoff loss in overtime to Arizona 6 seasons ago? This one was more blatant. So there appears to be a good argument that if a facemask hadn’t been called, a horse collar could have. Then there’s Aaron Rodgers’ quick feet and great arm strength on the Hail Mary. Tom Brady, great as he is, couldn’t have made that play because he wouldn’t have escaped the near sack by defensive end Jason Jones, who somehow split the double-team block by right guard Lane Taylor and right tackle Don Barclay. But Rodgers had the feet to get away, which gave his receivers all the time in the world to get to the end zone. Rodgers took a running start and threw the ball from his own 36. Richard Rodgers caught it about three yards into the end zone. So the ball flew about 67 yards in the air, hand to hand. More impressive was the height. A spokesman for Ford Field said the distance from the field to the catwalk above the field is 158 feet, or 52 2/3 yards. Judging by a video of the play shot from the stands and posted on Instagram, the ball couldn’t have been much more than 10 feet lower than the catwalk, so the pass likely was about 48 or 49 yards off the ground. That is an incredible display of arm strength. Brett Favre probably had as much pure arm strength as any quarterback of the last 25 years, and after watching that throw, it’s clear Rodgers’ arm strength isn’t far behind. The Packers’ passing game still is in bad shape, but you have to wonder if Aaron Rodgers has found a receiving target he trusts and who will catch the ball consistently in Richard Rodgers. Besides the 61-yard Hail Mary, Richard Rodgers caught seven passes for 85 yards, and he caught all eight passes thrown his way. Maybe his most impressive play was the 26-yard catch he had on a seam route in the fourth quarter. It was the kind of play the Packers rarely made in the passing game over the last six to eight weeks. Detroit blitzed linebacker Tahir Whitehead, which left the middle of the field open, and the Packers attacked the vacated area. Richard Rodgers beat safety Isa Abdul-Quddus on a post pattern by several yards, a rarity in itself. That’s where tight ends have to make their hay, in the middle of the field, and it makes you wonder where that has been all season. Richard Rodgers came in with 40 receptions but for only a 7.3-yard average, which even for tight ends is extremely low. The Packers mostly have been using him on short routes, but with his size and hands – he might have the best hands on the team – he should be a threat in the intermediate areas in the middle of the field. Jake Ryan played well enough to justify starting him at inside linebacker ahead of Nate Palmer. The fourth-round draft pick has a good feel for the position and is a little quicker to press the line of scrimmage than Palmer. He led the defense with 10 tackles and made an impressive play in the fourth quarter when he pressed the running lane, shed the block by fullback Michael Burton and dropped Joique Bell for a one-yard loss. Ryan, though, had one big error, on Lions tight end Eric Ebron’s three-yard touchdown pass. The Packers had a bad defensive call for the Lions’ alignment, with safety Ha Ha Clinton-Dix lined up to blitz on the right edge and Ryan lined up in the middle of the line. The Lions went with an empty set and no one was on Ebron. Coach Mike McCarthy tried to call time out but couldn’t get the officials’ attention. Ryan or someone else needed to get the Packers out of the blitz, or else Ryan needed to take a couple of steps over to get on Ebron, because Ryan didn’t have time to get in the passing lane and Ebron took a couple steps up field and had an easy catch for the score. We saw Thursday night why Aaron Rodgers and the coaching staff don’t have full trust in second-year receiver Jeff Janis. In the first quarter Janis got behind cornerback Nevin Lawson on a go route and Rodgers tried to hit him. But Janis drifted on his route and then slowed slightly as the ball was coming down, so he couldn’t quite catch up to the throw. Rodgers had correctly thrown the ball to Janis’ outside shoulder because Nevin had inside leverage, but Janis still drifted toward the middle of the field rather than anticipating the throw to the outside, and by the time he tracked the ball it was out of reach. 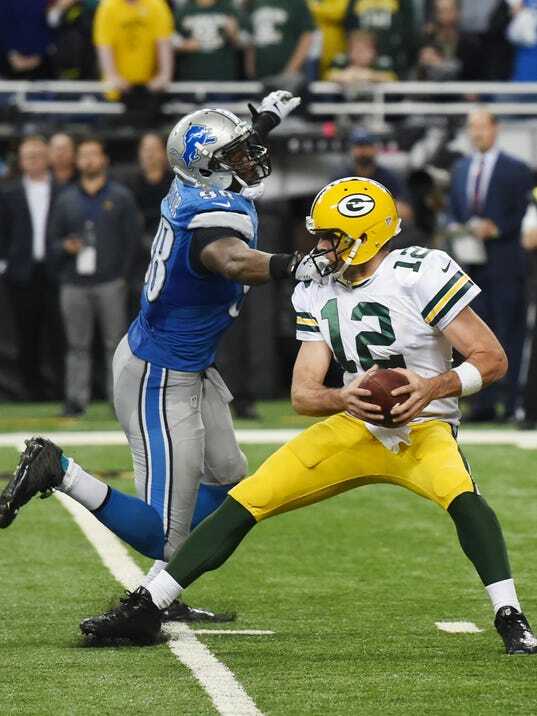 ~DETROIT — One throw — one heave, really — saved the Green Bay Packers’ season. And it was a bonus heave at that. With the game extended for an untimed play after a face-mask penalty by Detroit Lions defensive end Devin Taylor on what would have been the final, lateral-happy play, Aaron Rodgers — with all of his might — launched a 61-yard bomb into the Ford Field end zone that tight end Richard Rodgers somehow came down with to give the Packers an improbable 27-23 victory after they trailed 20-0. Aaron Rodgers launched it from about his own 35-yard line and Richard Rodgers caught it about four yards deep in the end zone, meaning the ball flew nearly 70 yards in the air. Perhaps it was fitting — or least soothing — that during a season in which the Packers have desperately missed their downfield receiver Jordy Nelson, they finally found a way to make a big play when they needed it most. What it means: The Packers (8-4) avoided getting swept by a division foe again. The last time it happened was 2009, when a Brett Favre-led Minnesota Vikings did it. The Lions’ last sweep came in 1991, and the Bears last did it in 2007. What were they thinking? Eddie Lacy was coming off his most productive stretch of the season with back-to-back 100-yard games against the Vikings and Bears. And yet James Starks got the start. Yes, Lacy has fumbled four times in his last five games, but he was the best thing going for the Packers’ offense coming into this game. One reason to get excited: General manager Ted Thompson made a roster move before the game when he promoted rookie running back John Crockett from the practice squad and released the seldom-used Alonzo Harris. Crockett started the second half and gave the Packers a little spark. After getting stuffed for no gain on his first carry, he had runs of 4 and 12 yards on the Packers’ first touchdown drive of the game. One reason to panic: The Packers are running out of offensive linemen. Already without right tackle Bryan Bulaga (ankle) and right guard T.J. Lang (shoulder), they lost center Corey Linsley to an ankle injury in the first half, and then David Bakhtiari appeared to sustain a knee injury early in the fourth quarter. Josh Walker, their last available linemen, replaced him for one play and gave up a sack before Bakhtiari returned. Fantasy watch: Davante Adams came in with the most catches (32) by any receiver without a touchdown this season. He finally caught one in the third quarter when Rodgers threaded the needle on a third-down play from the Lions’ 8-yard line. Ouch: In addition to the offensive line injuries, the Packers lost cornerbacks Quinten Rollins (arm) and Casey Hayward (unknown reason) for parts of the game. Game ball: The only ball that mattered fell into the hands of Richard Rodgers, who ended up with eight catches for 146 yards. Big sack: The Packers rested linebacker Julius Peppers in practice this week, the first time he hasn’t practiced since he signed with the Packers in 2014, and it paid off. His strip-sack of Matthew Stafford in the third quarter helped get the Packers back into the game after they trailed 20-0. What’s next: One benefit of a Thursday game is the mini bye that follows. The Packers don’t play against until Dec. 13 against the Dallas Cowboys at Lambeau Field.